Putrajaya, an “Intelligent Garden City” and the federal administrative capital of Malaysia, is a showcase city under construction some 30 km south of the capital Kuala Lumpur. Her adjacent sister city, Cyberjaya, is built along the same lines, but is aimed at attracting the IT industry. The area was formerly known as Prang Besar. Putrajaya covers a vast sprawl of 4,931 hectares, which were mostly palm plantations before the federal government purchased the lot from the surrounding state of Selangor. The city’s masterplan is designed along an axial tangent which runs from the northeast to southeast, with gently undulating terrain. About 40% of Putrajaya is natural, but the landscape has been extensively reworked by man: lush greenery and botanical gardens are spread across the landscape, crisscrossed by large bodies of water and wetlands. Five confluences meet at the north forming a main waterway, the Putrajaya Lake, which flows across the city area. The project was started in 1993 and the federal capital officially moved in 1999, although the site is still far from complete. 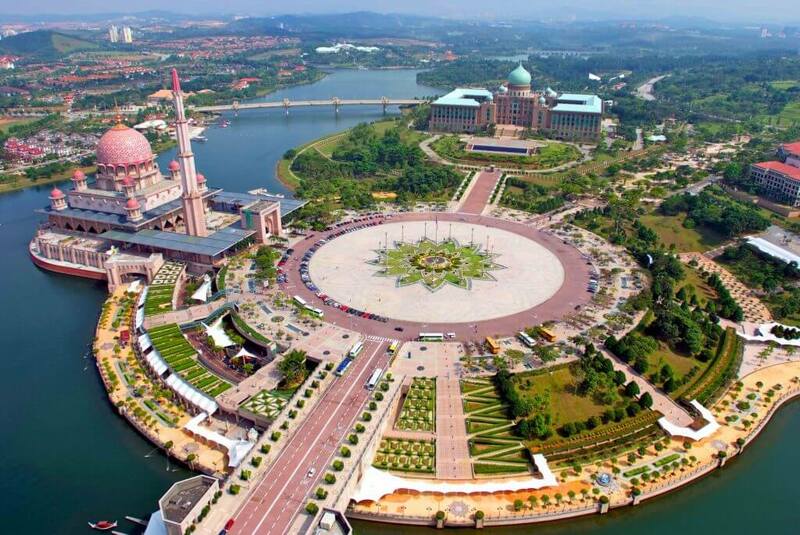 Putrajaya became a self-governing federal territory (wilayah persekutuan) in 2001, the third in Malaysia after Kuala Lumpur and the island of Labuan. The name literally means “princes’ (putra) success (jaya)”. Officially, the site is named in homage to Malaysia’s first prime minister, Tunku Abdul Rahman Putra. Ever since the Asian economic crisis of 1998 development has slowed down markedly, and while there aren’t any of the rusting half-built concrete shells that still litter KL and Bangkok, the careful eye will spot more than a couple of once cleared and dug-up but now abandoned fields (often with a crane or two stuck in the mud too). Basically, the infrastructure is largely in place but the buildings and occupants aren’t, leading to the impression of a giant swath of hilly jungle crisscrossed by 8-lane highways with no other cars on them, and the occasional beautifully sculpted lake garden with no people in sight. That said, the area remains under heavy construction and both people and companies are slowly moving in. As of 2009, the population has surpassed 50,000, although there’s still a long way to go to the targeted 300,000. Inevitably, development isn’t always occurring in expected ways: Cyberjaya has to date mostly succeeded in attracting call centers and data warehouses, R&D laboratories. The new twin cities may look very different in 5-10 years’ time. Perdana Putra, Presint 1. The gargantuan complex of the Prime Minister’s Office. Open to the public Mon-Fri 8 AM to 12:30 PM, 2 PM to 4 PM, plus every 2nd and 4th Sat in the morning only. Free entry, but ID is required (passport for non-Malaysians). Putra Mosque (Masjid Putra), Presint 1. Pretty in pink, this mosque has a capacity of 15,000 worshippers and its 116-meter minaret is the tallest in Southeast Asia. Free entry, open every day from 9 AM to 5 PM. Non-Muslims may not enter the mosque building itself during prayer hours. Putrajaya International Convention Center, Presint 5. Dominantly located at the end of the Putrajaya Boulevard, this showcase squashed UFO of a building, designed to resemble a Malay belt buckle, was built for the Organization of Islamic Countries conference in 2003. Seri Perdana. Enormous official residence of the Prime Minister of Malaysia. Has been open to visitors in the past, but as of 2009 is closed to the public. Wisma Putra. Houses the Ministry of Foreign Affairs (Malaysia). Istana Melawati and Istana Darul Ehsan, the official residences of the Paramount Ruler of Malaysia and the Sultan of Selangor respectively. Not open to the public. The Diplomatic Enclave, housing foreign embassies and missions — at least in theory; as of 2008, only the Iraqis have even started construction here. The Perdana Leadership Foundation, holding the offices of previous Prime Ministers, currently occupied by Tun Dr Mahathir Mohamad. Taman Putra Perdana, Presint 1. Pleasantly landscaped (and usually very quiet) hilltop park connecting the Shangri-La towards the Putra Perdana building, with some of the best views in town. At the center of the park is the Putrajaya Landmark (Mercu Tanda), which resembles a wizard’s hat rolled from tinfoil. Millennium Monument, Presint 2. 68-meter pillar in the shape of a hibiscus flower, with a walkway around it documenting the history of Malaysia. Putrajaya Boulevard, a 100-meter wide, 4-kilometers long boulevard flanked by government offices and the mainstage for National Day parade.